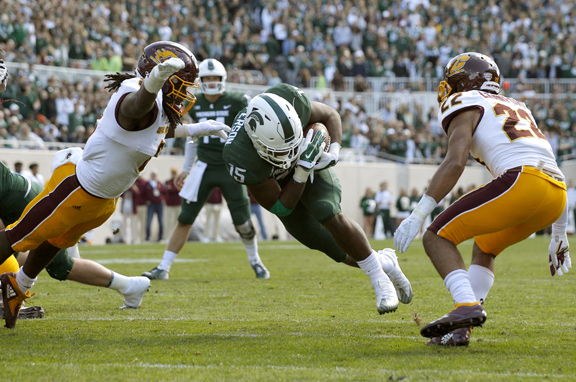 EAST LANSING — One thing Mark Dantonio can often count on is that Michigan State will be able to stop the run. “We’re building a wall, we’re not getting knocked off the ball, we’re tackling well,” said Dantonio, Michigan State’s coach. The Spartans have allowed 40 yards rushing per game. They’ve been so good against the run that they’d lead the nation in that category even if their 12 sacks (for 70 yards) were removed. Michigan State faces Northwestern this weekend. The Wildcats are last in the Big Ten in rushing and lost running back Jeremy Larkin last week when a medical condition involving his neck and upper back forced him to retire from football.